Grand Soleil has come up with something really different in its new Grand Soleil LC46. After the company was bought last year by the Italian Sly Yachts group, it has diversified from its background of performance cruisers with this new departure, an out-and-out cruiser design by one of the new owner’s favoured designers, Marco Lostuzzi. This move is just the start, as four more models will flesh out the range in the next few years, next up being a 58. You can see right away where Grand Soleil is going with features such as a shallow wraparound windscreen and cockpit arch for the mainsheet traveller and a bimini, as well as a forward sunbathing area and sun shelter. A self-tacking jib takes care of short-handing, and sheets and halyards are led back through the cockpit coamings to primary winches and rope bins situated right in front of the twin wheels. Down below a real dose of new Italian styling has been injected. The matt oak interior and floor panels are clean and elegant. The owner’s cabin is forward, with a twin cabin aft, which features clever sliding berths that can pull together to form a double. 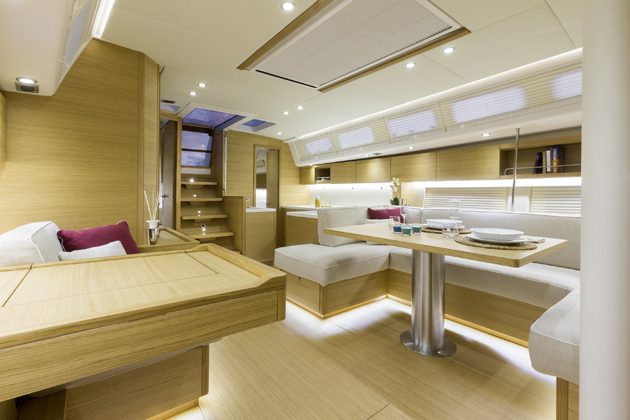 The boat abounds with clever touches, such as the navigating table that slides up or down to form a bunk base. This is an ideal Mediterranean yacht, and fuel and water tankage can be added if you want to go further.